This is a very rare zone-wide drop in Dreadspire Keep (both the normal zone and the Demi-Plane of Blood instance). You'll need the Dreadspire Crest to get to the south crypt, just kill till Darion pops and you might get lucky!! oh...and no, it didn't take just 5 days...had been there quite a few times before....be patient and keep on keeping on!! Just a clarification for those looking for this. The Dreadstones that this pouch summons have the same stats as the pouch itself. They are also not "No Rent", meaning if you camp out, they will be there when you log in again, unlike the daggers summoned by The Guardians Pouch. I was able to get this this drop fairly quickly judging by some of the posts I see here. Took just under 2 hours. I just killed everything I came across from zone in until deep in the castle. 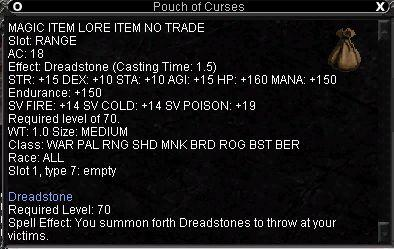 Don't remember what dropped it, was in a pile of corpses from one of my pulls. So, I've never played a monk or class that needs to throw items, so I'm looking for a little clarification on this. Can you keep the pouch in the range slot, then put the summoned stones in the ammo slot in order to throw them, or do you have to put the stones in the range slot? Afaik, you only need one in the range slot. Also dropped from "a shadowmane rogue" trash from Keleborne's room for me several weeks ago. Can a batling drop this? Also drops off trash in demiplane, A Frothing Shadowmane dropped it. Darion the Blade behind the secret door today (20061119). What mob drops this you ask? This item is a zone wide random drop. Drop from any mob in zone? I've spent some time trying to camp this by killing spiders in the pit off of the dining room, with no success. Does anyone know if this drops off of only the mobs listed, or is it a zone wide drop? a zombie guardian and a longfang bat drop it too...seem this's unmannered drop in this zone.